George W. Hay, PhD is a scholar-practitioner of management with global experience in business and academe. 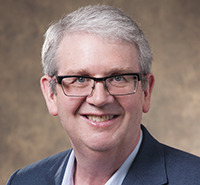 Currently George is the Associate Chair and an Associate Professor in the Business Psychology Department at the Chicago Campus of the Chicago School of Professional Psychology. He teaches in their PhD programs in Organizational Leadership and Business Psychology. George has taught courses for Benedictine University in organizational theory, research methods, and leadership practices to undergraduate, masters and doctoral students within the Chicago area as well as internationally in Shenyang, China. His academic research and publications focus on how scholar-practitioners create new theoretical knowledge and help their organizations to get breakthrough business results. Prior to joining The Chicago School of Professional Psychology, George was a Director of Global Consumer and Business Insights at McDonald's Corporation. Over his 15 years at McDonald's, he led domestic and international research initiatives involving the business disciplines of strategic planning, marketing and promotion, new products, operations and service, and human resources. His work delivered essential consumer insight and foresight which supported McDonald's brand improvement and business growth. George is interested in furthering his career as a scholar-practitioner of management through the practices of collaborative management and business research, the publication of scholarly and practitioner articles on organizational change, and the teaching of the next generation of organizational leaders. Tenkasi, R. V., &Hay, G. W.(2008). Following the second legacy of Aristotle: The scholar-practitioner as an epistemic technician. In A. B. Shani, N. Adler, S. A. Mohrman, W. A. Pasmore, & B. Stymne (Eds. ),Handbook of collaborative management research(pp. 49-72).Thousand Oaks, CA: Sage. Hay, G. W. ,Woodman, R., & Tenkasi, R. (2008). Closing the ODC application gap by bringing ODC knowledge closer to ODC practice.OD Practitioner, 40(2), 22-26. Stoughton, A., &Hay, G. W.(2008). A review of the effectiveness of accounting and financial metrics for organizational behavior interventions. InConference Proceedings of the International Conference and Doctoral Consortium, Organization Development and Change Division of Academy of Management and ISEOR: 1473-1482. Lyon, France: ISEOR. Hay, G. W., & Tenkasi, R. V. (2006). The future of Executive Doctorates of Management: A model for assessing the contributions of executive scholars to practice and theory. InConference Proceedings of the International Conference and Doctoral Consortium, Organization Development and Change Division of Academy of Management and ISEOR: 385-396. Lyon, France: ISEOR. Hay, G. W. (2006). New partners for strategic change and organizational transformation: The combined effects of market research and organizational development.Organization Development Journal, Winter. Tenkasi, R. V., &Hay, G. W.(2004). Actionable knowledge and scholar-practitioners: A process model of theory-practice linkages.Action Research and Systemic Practice, 17(3), 177-206. Hay, G. W. (2004). Executive Ph.Ds. as a solution to the perceived relevance gap between theory and practice: A framework of theory-practice linkages for the study of the Executive Doctoral Scholar-Practitioner.International Journal of Organizational Behaviour, 7(2), 375-393.